Stock photo of The Illuminated Crowd by artist Raymond Mason at the entrance to the BNP Tower - Laurentian Bank Tower in downtown Montreal, Quebec, Canada. The Illuminated Crowd by artist Raymond Mason at entrance to the BNP Tower - Laurentian Bank Tower. 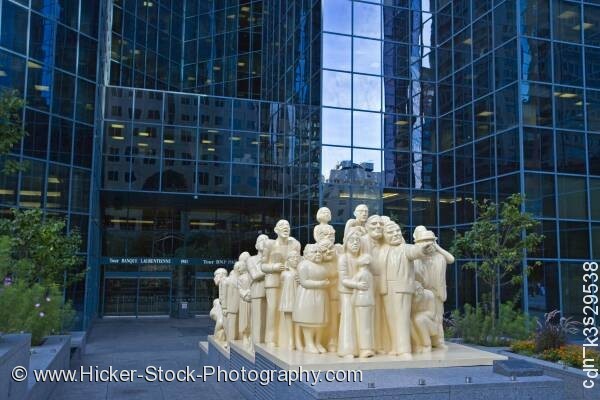 This stock photo shows an unusual statue, the Illuminated Crowd by artist Raymond Mason at the entrance to the BNP Tower - Laurentian Bank Tower in downtown Montreal, Quebec, Canada. This unique statue stands at the entrance to the BNP Tower in downtown Montreal. The statue called the Illuminated Crowd is a group of people which stand together on four steps. The statue is completely white and made from clay by the artist Raymond Mason. The people in the statue look as though they are looking at something in the distance. One man points with another crouched just behind him. A woman with her arms around a child stands at the front of the crowd. Each face shows its own expression. The Illuminated Crowd by artist Raymond Mason at the entrance to the BNP Tower - Laurentian Bank Tower in downtown Montreal, Quebec, Canada.